Haines seems like a quintessential Southeast Alaska town. There are eagles, bears, salmon, big mountains and rough water. It’s a picture-book no stoplight, no movie theater, low crime type of community. But there’s a seedier and eclectic side of Haines that emerged late this winter: the underground puppet scene. We aren’t talking about Muppets. Those fuzzy, funny and googly-eyed characters are not the same as puppets. Not in Haines, Alaska. 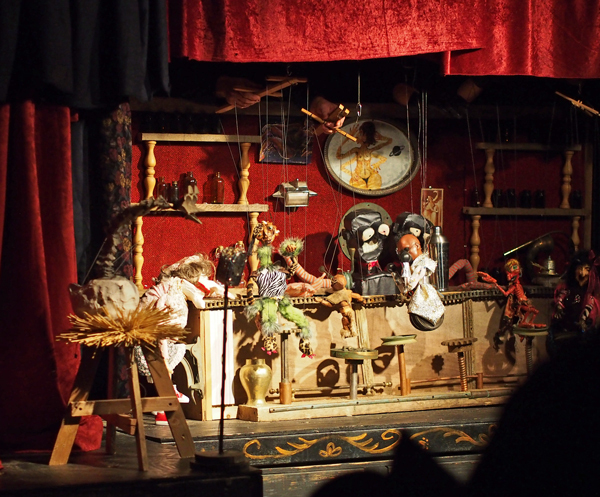 Here, there are at least three puppet troupes, dozens of self-taught puppeteers and puppet makers and one artist who has traveled to Europe to explore the history of puppetry, Byrne Power. “What I saw was a puppet troupe who was doing a show – it looked like stuff from their backyards, stuff you’d find at the Salvation Army, rusting metal, old toys – and I said ‘We could do that,’” Power said, at the Sheldon Museum in Haines where he helped curate the puppet exhibit Strung Up and Reconfigured. Power is sort of the father of puppetry in Haines. 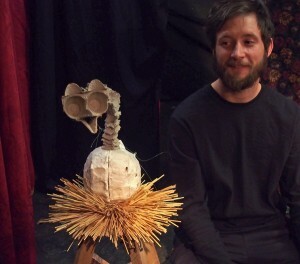 Almost 10 years ago he gathered a group of artists and formed a puppet troupe. Here’s artist Debi Knight-Kennedy explaining how she fell into the puppet scene. “Byrne came up to me one day before I knew him very well and he said ‘So, you’re a doll maker.’ And I said, ‘No, I make figurative sculpture.’ And he said ‘Yeah, yeah, whatever. So you can make your dolls talk. I’m starting a puppet troupe.’ And that was it. It was all over for me,” Knight-Kennedy said. After a few years, Power stayed with traditional puppetry, while some in the group wandered in a different direction. Now the group is called Geppetto’s Junkyard and consists of more than a dozen people including a plumber, a yogi, a boat builder, retired teacher, jujitsu instructor and others. This winter, they created a show called “Space Lust.” It was described on posters as a cross between steam punk, space cowboy and puppet space opera. It was wild scene of live music, special effects, acting and of course, puppets. 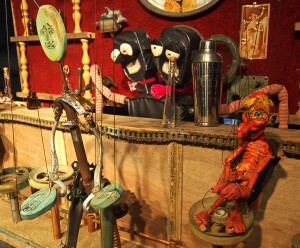 The puppets are all hand-made and usually assembled from found objects, like bicycle parts, kitchen gadgets, vacuum hoses and carved wood. Knight-Kennedy’s husband, Gene Kennedy is also in the troupe. He’s a handyman and plumber, but is drawn to creating puppets, like the carved wooden horse he made, with multiple moving parts. Geppetto’s Junkyard has their fans. They pack in the sporadic shows. But no one – especially the puppeteers and actors, pretend they are traditionalists. Power is more so. Back at the museum he says he doesn’t think anyone in Haines is true to traditional puppetry. Of the more than 100 puppets in the exhibit, about two-thirds were made locally. There was even one that might be local from several generations ago. It’s a bone, shell and sinew Tlingit puppet on loan from the Metropolitan Museum of Art. Puppets, Power said, cross all cultures. In Haines this winter, puppets were everywhere. Besides the museum exhibit and Geppetto’s Junkyard show, Power also put on a show. Students at the Haines School created their own puppets. There was even a visit from Carlton Smith of Juneau who performs Tlinigt ventriloquism with his puppet, Charlie. Power says he’s drawn to puppets because they still surprise people. He says when he goes on the road with a show, he’s not pigeon-holed because puppets are still edgy and intriguing enough to cross all ages and interests. And maybe that’s why puppets and Haines go together. 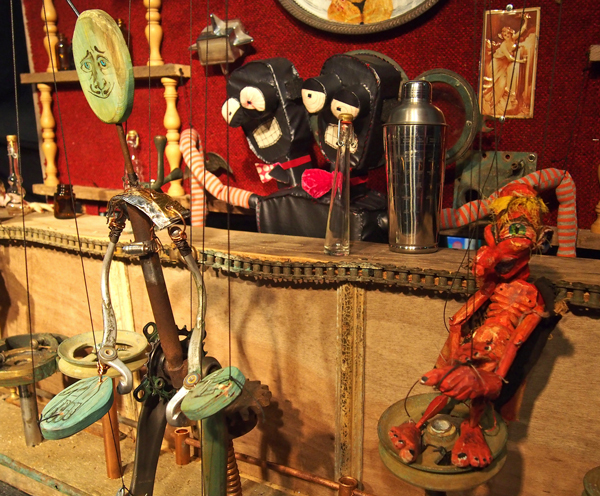 For puppeteers like Melina Shields with Geppetos Junkyard, it makes perfect sense.